Through the first day of basketball, five of eight brackets we published in this Wildcard post registered more first day wins than any of the CBS crew, and were rated as red hot in ESPN's bracket tracking. The bracket based on the "Healtiest" team was correct on 14 of 16 Thursday games to land in the 97th percentile of the millions of brackets submitted. 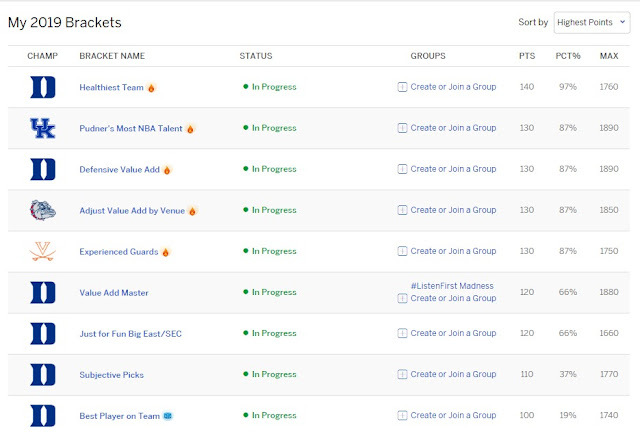 However, the brackets based on which teams the www.valueaddbasketball.com site calculates has the most NBA talents and the bracket based on the teams with the best DEFENSIVE Value Add rankings picked 13 of 16 correctly and have the highest ceiling with a total of 1890 total points based on ESPN's calculations of how man possible points the bracket could yield. The Value Add bracket adjusted by where games are played, and the one weighted toward the most experienced point guards also was correct on 13 of 16 picks. The four CBS commentators doing the night's wrap up revealed that their four experts on set all had either 11 or 12 correct. That was the same as the bracket based purely on Value Add ratings with none of the adjustments above (12 of 16) and the purely subjective picks (11 of 16). the one bracket rated "ice cold" by ESPN was the bracket based on which team had the best player on the court, which was correct only 10 of 16 games for 100 points - or the 19th percentile. The following is the calculation by ESPN of each of the brackets, what percentile that places each bracket, and how many total MAX points the bracket could yield (lower if teams picked in later rounds were already eliminated. The following the actual photo of the ESPN calculations for each of our brackets. The following shows the average number of wins selected from the millions of brackets this year. For example, Duke is listed on an average of 4.36 lines per bracket, while North Dakota State squad that was listed on an average of 0.05 lines per bracket. They were actually picked on only one in 40 brackets to win the first game, but then a few picked them to go deeper into the tournament. Fans who submitted brackets should understand that they should root against teams that they pick IF most fans picked them in more games than they did. For example, if someone picked North Carolina to win only two games and they were losing the second game, the person who put them on only two lines would want them to lose since it will hurt their average competition more because they were listed on an average of 3.75 wins. Yes, the person doesn't get their second win from North Carolina, but their competition is eliminated from getting wins in the third and fourth round, which count for many more points than the 10 points per win in the opening two days. The following table shows if the team has been eliminated (Done), which team has wins to date, and how many lines the team appeared on in the average bracket.